Kyle Lowry recorded his 13th career triple-double on Wednesday night as the Toronto Raptors defeated the Atlanta Hawks 124-108. Lowry finished the game 21 points, 17 assists, and 12 rebounds. Jonas Valanciunas started his seventh game of the season, recording a double-double by scoring 24 points and grabbing 13 rebounds in 27 minutes of action. Pascal Siakam scored 22, and Serge Ibaka scored 19 points and grabbed 9 rebounds off the bench. 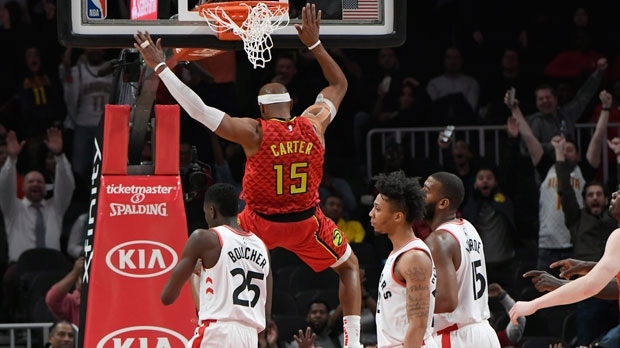 Jeremy Lin scored 26 points off the bench to lead Hawks scoring, and a familiar face in Vince Carter scored 14 points. Carter needed 13 points on the night to become the 22nd player to score 25,000 points in the NBA. It was fitting that Carter hit this milestone against his first team, and with a dunk. Vince Carter put Toronto and Canada on the basketball scene, which Kyle Lowry talked about in his post-game interview. "Vince is half man, half amazing"
The Raptors won the game, but the night belonged to #15, Vince Carter. Toronto returns home to Scotiabank Arena on Friday night as they play a struggling Washington Wizards side. Tip-off is set for 7:30 p.m. Featured image from John Amis/The Associated Press.